Isco to Manchester City – it is the rumour that never dies, even when it seems done and dusted. And despite indications in recent days that the saga – dating back to 2013 – is over, it has sprung back to life this evening in Spain. 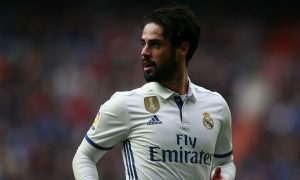 Journalist Manu Sainz of the AS newspaper has sensationally claimed this evening that entourage of Isco have been contacted ‘in recent hours’ by an intermediary representing Manchester City to express the club’s wish to sign him for next season. The Spain international is under contract at Real Madrid until 2022, but for the first time is seriously considering leaving after falling out of favour with coach Santiago Solari. And Isco is reported to be relieved at hearing of Manchester City’s interest, with Pep Guardiola said to have prioritised signing the 26-year-old for the 2019/20 season, perhaps as a long-term replacement for David Silva. Despite his difficult moment at Real Madrid, Los Blancos will demand a fee no less than €100 million (£89.9 million) for the playmaker, who famously snubbed City in 2013 for a move to Madrid. The European champions know of Isco’s value, even if he currently isn’t showing it for them. Isco believes Pep Guardiola can return him to his full world class level, unlike current Madrid boss Solari, and is described as ‘excited’ at the idea of working under Pep at the Etihad Stadium. Another false dawn? Maybe, maybe not, but the Isco saga is alive and well – just when the book seemed to have been closed at last.